Barberry is a traditional bitter tonic that helps support the liver functions and cleanse a congested system. 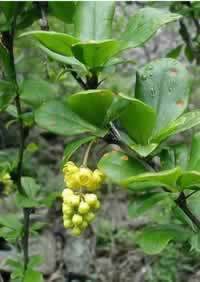 1 Barberry is rich natural source of berberine. Berberine is bright yellow and somewhat bitter, and has long been used in traditional medicine for its anti-inflammatory and anti-microbial effects. 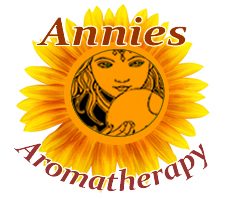 This well known antiseptic photochemical, also found in goldenseal and Oregon grape root, is used to treat a wide range of infections of the ears, eyes, mouth, and throat, staph and strep bacteria, each of which can commonly cause bacterial pinkeye. In fact Murine© eye drops contain berberine as the active ingredient. Other common infections that can effectively be treated by barberry include yeast and bladder infections, and skin disorders, especially those like psoriasis that can benefit from a liver tonic. Preparation Methods & Dosage :Liquid root extract is the most convenient way to use barberry. Must be used long term to see benefits. Follow dosage directions on bottle. 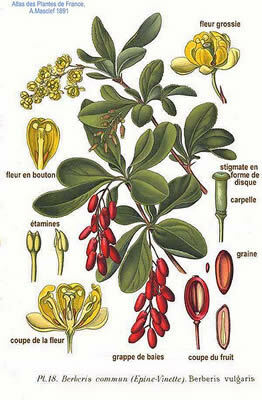 Barberry root bark can be used in teas, tinctures, or incorporated in creams and lotions for external use. Ayurvedic Medicine Indian Barberry has the same main constituent, berberine, as the other species and in used in Ayurveda mainly for the liver. Flowers:Inflorescence long, drooping, many-flower racemes, of pale yellow flowers. Leaves: Inversely egg shaped, short-petioled, closely serrate, and bristly-toothed. Barberry bushes are a low maintenance ornamental shrub that can add color to your landscape. Widely available at plant nurseries.